In April 2017, MEarth announced the discovery of LHS1140b, a rocky planet 1.7 times the size of the Earth. LHS 1140b transits a star that is both very small (1/5 the size of the Sun) and very nearby (only 49 light years away). It also receives similar amounts of energy from its star that Earth does from the Sun, which means it may have liquid water on its surface! An additional transiting rocky planet was detected in this system during 2018. LHS 1140c is 1.3 times the size of the Earth and has a shorter orbital period. In November 2015, MEarth announced the discovery of GJ1132b, a rocky planet only 1.2 times the size of the Earth. Thanks to the small size of the host star (1/5 the radius of the Sun) and the system's close proximity (only 39 light years away), astronomers will be able to spectroscopically study the atmosphere of this new world. GJ1132b is too hot to be habitable, but observations of this rocky planet's atmosphere will inform the search for life on planets a little cooler than GJ1132b, transiting nearby M dwarfs. 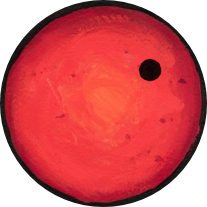 GJ1214b was the first first super-Earth exoplanet discovered by MEarth. It orbits the M dwarf GJ1214, which is a very small star that is very nearby. Because of this, GJ1214b is an easy planet to observe and has become the subject of many observational and theoretical studies in the exoplanet community. Our original observations of GJ1214b's atmosphere led to the largest allocation of Hubble Space Telescope time ever given to study an exoplanet's atmosphere, proving GJ1214b's atmosphere must host high altitude clouds. GJ1214b is too hot for life, but it is an important stepping stone for developing the techniques we will need to study habitable exoplanets around nearby M dwarfs soon. In spite of the fact that M dwarfs are so valuable as transiting exoplanet hosts, there were only poor constraints on the fundamental properties of the nearby M dwarfs, until recently. Using astrometric data from the MEarth telescopes, we directly measured distances for 1507 nearby mid-to-late M dwarfs, providing the first ever geometric measurements for many of these stars. Through a large program of near-infrared spectroscopy, we measured metallicities for 447 nearby M dwarfs in the northern hemisphere, providing a crucial window into the abundance of planet-building heavy elements in these systems. These projects are critical steps toward compiling a clean, well-understood sample of the best potential exoplanet hosts for MEarth and other exoplanet surveys. An outstanding challenge for astronomers is how to reliably estimate the fundamental properties of M dwarfs. Observations of eclipsing binary systems, in which two stars orbit and occasionally block each others' light, allow us to measure both the masses and radii of the component stars. This helps us calibrate models of M dwarfs and address this question. With MEarth, we've found a number of these systems, including short period and intermediate period M dwarf eclipsing binaries, a brown dwarf in a triple system, and a very long period eclipsing binary. Studying systems like these to learn more about the fundamental properties of M dwarf stars is important for exoplanets too, because we can understand the properties of a planet only as well as we understand the star it orbits! M dwarfs have starspots on their surface, just like sunspots on the Sun. Because we monitor M dwarfs over many months, we can see these starspots rotate in and out of view, causing the stars to appear brighter or fainter. With MEarth, we've measured how fast many of our Northern and Southern M dwarfs spin, finding they can have rotation periods ranging from a few hours to more than 100 days. By studying the ensemble of stars we've observed, we're starting to understand how the angular momentum of an M dwarf evolves as it ages. R. Vanderspek, C. X. Huang, A. Vanderburg, et al., "TESS Discovery of an ultra-short-period planet around the nearby M dwarf LHS 3844" 2019, The Astrophysical Journal, 871, 24. N. Mondrik, E. Newton, D. Charbonneau, J. Irwin, "An increased rate of large flares at intermediate rotation periods for mid-to-late M dwarfs" 2019, The Astrophysical Journal, 870, 10. K. Ment, J. A. Dittmann, N. Astudillo-Defru, et al., "A second planet with an Earth-like composition orbiting the nearby M dwarf LHS 1140" 2019, The Astronomical Journal, 157, 32. E. R. Newton, N. Mondrik, J. Irwin, J. G. Winters, D. Charbonneau, "New rotation period measurements for M dwarfs in the southern hemisphere: an abundance of slowly rotating, fully convective stars" 2018, The Astronomical Journal, 156, 217. J. Irwin, D. Charbonneau, G. Esquerdo, et al., "Four new eclipsing mid M-dwarf systems from the New Luyten Two Tenths catalog" 2018, The Astronomical Journal, 156, 140. M. Damasso, A. S. Bonomo, N. Astudillo-Defru, X. Bonfils, L. Malavolta, A. Sozzetti, E. Lopez, L. Zeng, et al., "Eyes on K2-3: A system of three likely sub-Neptunes characterized with HARPS-N and HARPS" 2018, Astronomy & Astrophysics, 615, 69. J. J. Spake, D. K. Sing, T. M. Evans, et al., "Helium in the eroding atmosphere of an exoplanet" 2018, Nature, 557, 68. J. G. Winters, J. M. Irwin, E. R. Newton, D. Charbonneau, D. W. Latham, E. Han, P. S. Muirhead, P. Berlind, M. L. Calkins, G. Esquerdo, "LHS 1610A: A Nearby Mid-M Dwarf with a Companion That is Likely A Brown Dwarf" 2018, The Astronomical Journal, 155, 125. J. A. Dittmann, J. M. Irwin, D. Charbonneau, Z. K. Berta-Thompson, E. R. Newton, "A Search for Additional Bodies in the GJ 1132 Planetary System from 21 Ground-based Transits and a 100 Hour Spitzer Campaign" 2017, The Astronomical Journal, 154, 142. J. E. Rodriguez, G. Zhou, A. Vanderburg, J. D. Eastman, L. Kreidberg, P. A. Cargile, A. Bieryla, D. W. Latham, et al. "A Multi-Planet System Transiting the V = 9 Rapidly Rotating F-Star HD 106315" 2017, The Astronomical Journal, 153, 256. J. A. Dittmann, J. M. Irwin, D. Charbonneau, X. Bonfils, N. Astudillo-Defru, R. D. Haywood, Z. K. Berta-Thompson, et al. "A temperate rocky super-Earth transiting a nearby cool star" 2017, Nature, 544, 333. J. A. Dittmann, J. M. Irwin, D. Charbonneau, Z. K. Berta-Thompson, E. R. Newton, D. W. Latham, C. A. Latham, G. Esquerdo, et al. "Discovery and Precise Characterization by the MEarth Project of LP 661-13, an Eclipsing Binary Consisting of Two Fully Convective Low-mass Stars" 2017, The Astrophysical Journal, 836, 124. E. R. Newton, J. Irwin, D. Charbonneau, P. Berlind, M. L. Calkins, J. Mink, "The Hα Emission of Nearby M Dwarfs and its Relation to Stellar Rotation" 2017, The Astrophysical Journal, 834, 85. A. W. Mann, E. R. Newton, A. C. Rizzuto, J. Irwin, G. W. Feiden, E. Gaidos, G. N. Mace, A. L. Kraus, et al. "Zodiacal Exoplanets in Time (ZEIT). III. A Short-period Planet Orbiting a Pre-main-sequence Star in the Upper Scorpius OB Association" 2016, The Astronomical Journal, 152, 61. E. Newton, J. Irwin, D. Charbonneau, Z. K. Berta-Thompson, J. A. Dittmann, A. A. West, "The rotation and Galactic kinematics of mid M dwarfs in the Solar Neighborhood" 2016, The Astrophysical Journal, 821, 93. J. A. Dittmann, J. M. Irwin, D. Charbonneau, E.R. Newton, "Calibration of the MEarth Photometric System: Optical Magnitudes and Photometric Metallicity Estimates for 1802 Nearby M-dwarfs" 2016, The Astrophysical Journal, 818, 153. Z. K. Berta-Thompson, J. Irwin, D. Charbonneau, E. R. Newton, J. A. Dittmann, N. Astudillo-Defru, X. Bonfils, M. Gillon, E. Jehin, A. A. Stark, B. Stalder, F. Bouchy, X. Delfosse, T. Forveille, C. Lovis, M. Mayor, V. Neves, F. Pepe, N. C. Santos, S. Udry, A. Wunsche "A rocky planet transiting a nearby low-mass star", 2015, Nature, 527, 204-207. A. Vanderburg, J. Johnson, S. Rappaport, A. Bieryla, J. Irwin, J. A. Lewis, D. Kipping, W. R. Brown, P. Dufour, D. R. Ciardi, R. Angus, L. Schaefer, D. W. Latham, D. Charbonneau, C. Beichman, J. Eastman, N. McCrady, R. A. Wittenmyer, J. T. Wright, "A disintegrating minor planet transiting a white dwarf" 2015, Nature, 526, 7574. A. A. West, K. L. Weisenburger, J. Irwin, Z. K. Berta-Thompson, D. Charbonneau, J. A. Dittmann, J. S. Pineda, "An Activity-Rotation Relationship and Kinematic Analysis of Nearby Mid-to-Late-Type M Dwarfs" 2015, The Astrophysical Journal, 812, 1, 3. P. K. G. Williams, E. Berger, J. Irwin, Z. K. Berta-Thompson, D. Charbonneau, "Simultaneous Multiwavelength Observations of Magnetic Activity in Ultracool Dwarfs. IV. The Active, Young Binary NLTT 33370 AB (= 2MASS J13142039+1320011)" 2015, The Astrophysical Journal, 799, 192. J. Irwin, Z. K. Berta-Thompson, D. Charbonneau, J. A. Dittmann, E. E. Falco, E. R. Newton, P. Nutzman, "The MEarth-North and MEarth-South Transit Surveys: Searching for Habitable Super-Earth Exoplanets Around Nearby M-dwarfs" 2015, Proceedings of 18th Cambridge Workshop on Cool Stars, Stellar Systems, and the Sun, pp.767-772. J. Dittmann, J. Irwin, D. Charbonneau, Z. K. Berta-Thompson, "Trigonometric Parallaxes for 1507 Nearby Mid-to-late M Dwarfs" 2014, The Astrophysical Journal, 784, 156. Z. K. Berta, J. Irwin, D. Charbonneau, "Constraints on Planet Occurrence around Nearby Mid-to-late M Dwarfs from the MEarth Project" 2013, The Astrophysical Journal, 775, 91. Z. K. Berta, J. Irwin, D. Charbonneau, C. Burke, E. Falco, "Transit Detection in the MEarth Survey of Nearby M Dwarfs: Bridging the Clean-First, Search-Later Divide" 2012, The Astronomical Journal, 144, 145. M. McLean, E. Berger, J. Irwin, J. Forbich, A. Reiners, "Periodic Radio Emission from the M7 Dwarf 2MASS J13142039+1320011: Implications for the Magnetic Field Topology" 2011, The Astrophysical Journal, 741, 27. X. Bonfils, J.-M. Almenara, R. Cloutier, et al., "Radial velocity follow-up of GJ1132 with HARPS. A precise mass for planet 'b' and the discovery of a second planet", 2018, Astronomy & Astrophysics, 618, 142. H. Diamond-Lowe, Z. Berta-Thompson, D. Charbonneau, E. M.-R. Kempton, "Ground-based optical transmission spectroscopy of the small, rocky exoplanet GJ 1132b", 2018, The Astronomical Journal, 156, 42. J. G. Winters, R. A. Sevrinsky, W.-C. Jao, T. J. Henry, A. R. Riedel, J. P. Subasavage, J. C. Lurie, P. A. Ianna, C. T. Finch, "The Solar Neighborhood XXXVIII. Results from the CTIO/SMARTS 0.9m: Trigonometric Parallaxes for 151 Nearby M Dwarf Systems", 2017, The Astronomical Journal, 153, 14. E. R. Newton, J. Irwin, D. Charbonneau, Z. K. Berta-Thompson, J. A. Dittmann, "The Impact of Stellar Rotation on the Detectability of Habitable Planets around M Dwarfs", 2016, The Astrophysical Journal, 821, 19. E. R. Newton, D. Charbonneau, J. Irwin, A. Mann, "An Empirical Calibration to Estimate Cool Dwarf Fundamental Parameters from H-band Spectra", 2015, The Astrophysical Journal, 800, 2, 85. L. Kreidberg, J. Bean, J.-M. Désert, B. Benneke, D. Deming, K. Stevenson, S. Seager, Z. K. Berta-Thompson, A. Seifahrt, D. Homeier, "Clouds in the atmosphere of the super-Earth exoplanet GJ1214b", 2014, Nature, 505, 7841, 69-72. E. Newton, D. Charbonneau, J. Irwin, Z. K Berta-Thompson, B. Rojas-Ayala, K. Covey, J. Lloyd, "Near-infrared Metallicities, Radial Velocities, and Spectral Types for 447 Nearby M Dwarfs" 2014, The Astronomical Journal, 147, 1. This website is maintained by members of the MEarth Project. Please feel free to contact us with any comments or questions.